We’ve all heard it before: The power of positive thinking can change our lives and encourage personal growth. Plenty of studies back that up—according to one recent Harvard study, women who were optimistic actually lived longer than those who were less-so. We see less dramatic examples of this on the mat all the time. For me, it was Chair Pose. I used to grimace when it was called, thinking somehow that the teacher would realize my discontent and change up the flow. Years of unanswered grimaces caused me to hate the pose with even more veracity than with which I began. And then one teacher randomly made me laugh while in it, acknowledging how horrid the pose could be. As soon as I smiled, it magically became easier. I’ve smiled in every Chair Pose since, and I no longer dread it. “There is so much synergy between how we hold ourselves, and the energy that we have in every single walk of life,” says Luke Milton, fitness trainer and former Australian National Rugby League player. The same can be said in fitness. When we approach our practice with positivity—whatever it may be, even if it extends beyond our comfort zone—we learn how not only to accept challenges that scare us, but also, just how capable we really are. “So many people will go into fitness, regarding the health, regarding their body, being confused in the process,” says Luke. “My job is to reinforce common sense back into the industry, because if you’re good at something, you can be good at everything. It’s a learned skill.” It’s this way of thinking that allows even the most ardent detractor of Chair Pose to learn to love it. When we approach physical challenge in our practice with the positive outlook that we can overcome the negative voice inside that says “we can’t,” we set a tone—not only for class, but for our lives. Luke says, for example, that when we wake up and recite positive affirmations, we begin our day from a place of empowered optimism, and are more likely to achieve what we set out to. This is true particularly when approaching something that scares us; we should, in fact, seek out challenges in order to keep growing and moving forward. 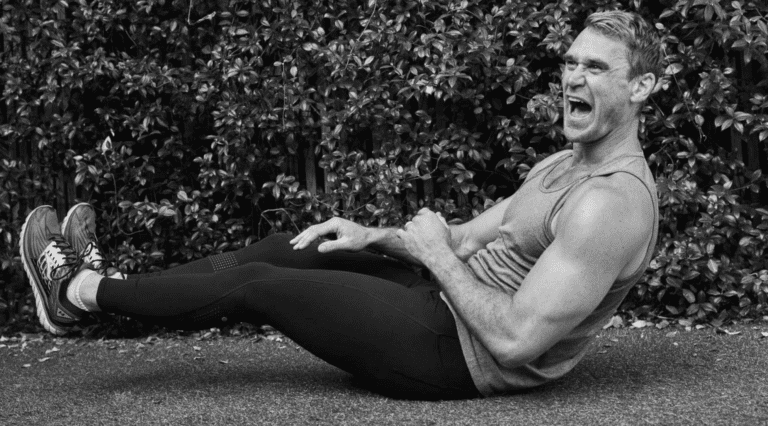 “If you’re complacent with your workouts, I always say, you’re going to be complacent with your jobs or with your family life or the activity as a husband, wife, father, mother, daughter, or son,” says Luke. “I think all of these things work together, so if we can be energetic with our health, it really stems into making us energetic in our careers, in our family lives, in our relationships, across the board.” That is, when we not only accept challenge with a smile, but also seek it out, we’re catalyzing personal growth and development. Approaching it with a positive attitude only makes those growing pains that much easier. This plays into the idea that happiness—or at least contentment—is a choice. We cannot control many of the circumstances in our lives that cause us pain, suffering, or challenge. We can, however, control how we react to these moments. If we approach even the most trying times with gentle lovingkindness and acceptance, finding light is possible even in the darkest night. Luke believes that approaching any fitness practice with this attitude allows you to grow not only emotionally, but physically as well. When that kind of positivity becomes a habit, it all of a sudden is second nature, and everything—even that handstand you’ve been dreading—becomes a fun opportunity to explore your limits, rather than knock up against them. Any sort of fitness activity can be a great way to break stuck patterns, to release ourselves from the shackles of negative self-talk that keep us from wanting to try new things. Rather than approaching fitness activity as something you’re “good” at—or something that’s “not for you”— Luke encourages his students to think about physical activity the same, all across the board. “Whether we’re running, or we’re stretching, whether it’s yoga, whether it’s HIIT, I believe we’re doing the same thing,” says Luke. “We’re encouraging the heart to pump out more oxygenated blood and we’re getting it to those working muscles that were fatigued,” he says. “It’s all the same thing to me because I really enjoy getting that circulatory system pumping and really working and getting into that central nervous system.” For Luke, it’s just about getting the whole body involved in the action. Just as we can balance the physical with the psychological—finding the edge of physicality through positive thinking—Luke believes that the journey to wellness is an integrated practice. “I’m really big on we have to live a very balanced life in physical health, social health, and mental health. And all three of those need to be of huge [importance] equally,” he says. Physically, this means moving oxygen through our blood. “Nutritionally,” he says, “it means we have to get the clean, natural products like Swisse into our bodies. We need to facilitate our body, give it the ability to be able to provide for us.” Emotionally, Luke says this requires us to go out and spend time with people, to satisfy social needs.